One Friday we got an email saying ‘I love your concept, could we really use the Celpax device for free?’ “Oh yes!” was our answer. Zerorez Minnesota, a US company offering revolutionary cleaning services, had successfully rolled out their Weekly Balanced Scorecard. “We didn’t have anything on our employee engagement”, recalls Scott Oremland, COO. How can I get my people on our weekly scorecard? “I liked the simplicity of just pressing green or red, I didn’t want a 20-question survey no one would ever fill out. And if it’s a pulse survey sent out every Friday then we will never know how our Mondays are. Your last day might have been bad, but maybe not your whole week”, Scott clarifies. After verifying that there really was no charge to try it out, Zerorez decided on an image template and Scott ordered the device online. “The day I received the box I was like woooow! I took it in my hands and went over to my colleagues to show them”, he continues. “At some point we actually got skeptical and started thinking “What if we put this in place and it doesn’t work?” he says and points to the box hanging by time clock at Zerorez. “What if it becomes just this thing that sits on the wall and we don’t do anything about it?“, Scott remembers. ”It involves everybody in the company and we didn’t want to fail. A week after the Celpax arrived we decided to go for it, as it seemed so simple”, the COO says with a smile. “One of our values is to work hard and have fun! We care about each other and want to feel like a family. Measuring the happiness of our workers is in line with this. We want people to come in to work with a purpose and a commitment to wow!”, Scott continues. “After the decision was made I installed our Celpax. It’s really that easy, you just put it up on the wall!” says Scott. 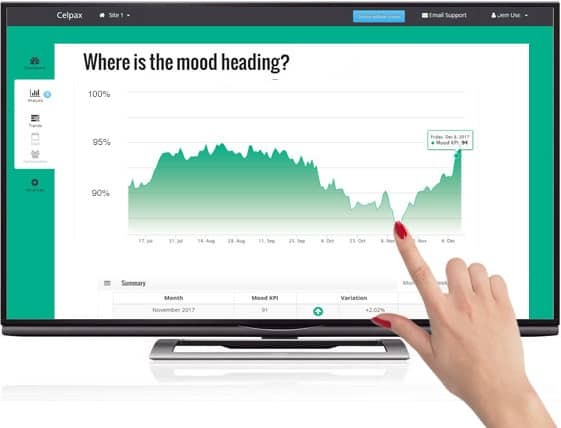 He then got familiar with the dashboard where the employee mood results from their 150 employees would be displayed. Scott was anxious to start and the big question was of course: What would the employee mood be at Zerorez? Would people press more green or red? What happened once Scott had installed? Read the next part here. 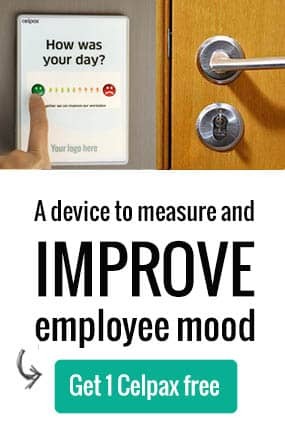 Would your employees press green or red? 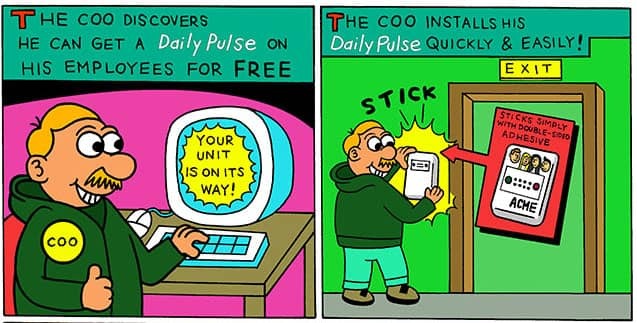 We will send you 1 Daily Pulse to find out for free. Measure, improve, repeat! Maria Martini, Assistant Call Center Manager and Alex Bialke, Commercial Route Manager at Zerorez Minnesota. Hej! I’m Rebecca, co-owner at Celpax. 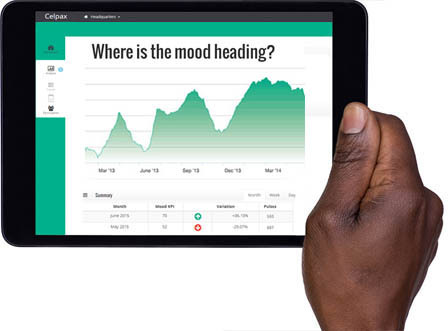 We use simple tech tools to measure and create a great work environment. And build a better society while at it! Interested in the future of work and employee wellbeing? Me too! Let’s chat on Twitter. 1100 Days of Real Time Employee Mood – Congrats Zerorez!